Beginner cross stitch kits give you, or your child, an opportunity to try this form of needlework, without spending a fortune or taking forever to complete something. If you find that you enjoy it, you could have a hobby for life. If you discover it isn't for you, then you haven't wasted much time or money and can move on and try something different. So what marks a kit as being suitable for beginners? Although a larger design may not be any more complex to stitch than a small one, the sheer volume of stitching required can be overwhelming. The sense of achievement when you complete a small project is what will have you eager to start the next. You can mount your first projects in aperture cards and send them to family and friends for their birthdays or Christmas. If you choose a design with many close shades of embroidery floss then it can be difficult to be certain you have picked the right color. This can be alleviated if the threads come pre-sorted on a card, but it is best to pick patterns with distinctly different colors for an early project. If a design has lots of colors you may be forever rethreading needles, instead of stitching. Look for beginner cross stitch kits that only use a small number of colors. Designs with softly blended colors may appeal to you more than the flat cartoon style, but leave them for when you have a little more experience. Some people hate fractional stitches, whereas others enjoy the challenge. Many designers find it more difficult to design using only whole cross stitches, while still keeping the design size manageable. Quarter and three-quarter stitches can avoid the stair step appearance of a totally whole stitch pattern. For your first projects fractional stitches are perhaps best avoided, as they are more suited to the higher count evenweave fabrics. The blockweave Aida fabrics are easiest to learn on. Some people find Aida unattractive when areas of background are left unstitched, but it is generally considered ideal for beginners as the corner holes are easy to see. 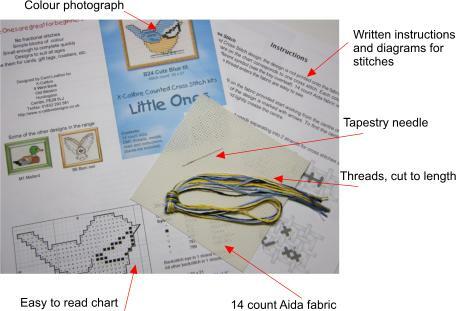 For youngsters it is possible to find beginner cross stitch kits containing 11 count Aida, but 14 count is generally used for older children and adults. Click to read my story of teaching needlework to children. If you are looking for simple cross stitch designs for children or beginners why not check out my NEW ebook of cross stitch owls and other birds.